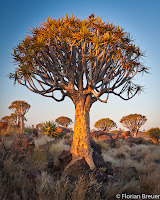 In June I drove up to Namibia to attend the amazing Aus workshop, run by Wicus Leeuwner and JJ van Heerden. This was my first ever photographic workshop, and I learnt a huge amount - I think my photography really improved there. 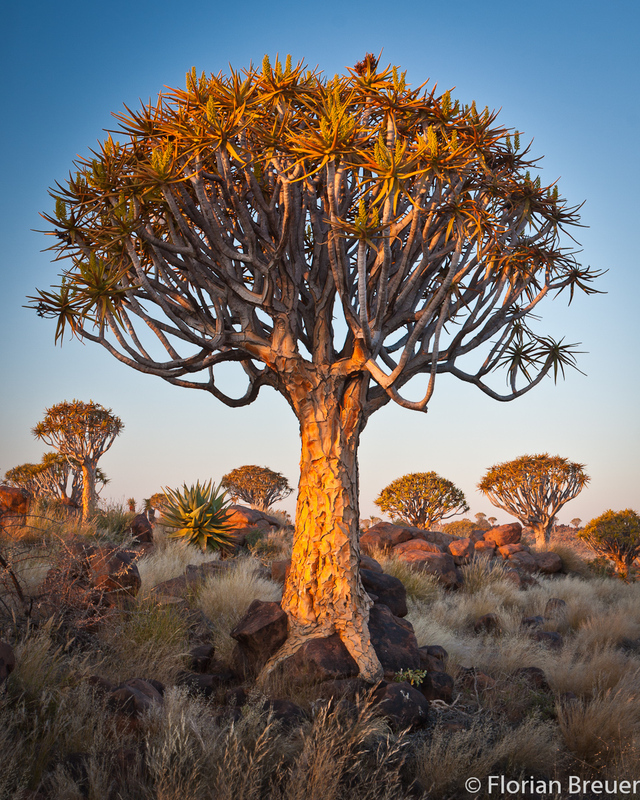 On the way there, I stopped for two nights at the Quiver Tree Forest near Keetmanshoop, Namibia, to photograph quiver trees. These are actually aloes (Aloe dichotoma) which thrive in the hot, dry conditions amongst dolerite boulders. I'll probably write more about my trip - and the workshop - some other time, but here's just a quick tip for others heading off in that direction: do follow the signs to the mesosaur fossils - the fossils may not be very impressive, but the landscape there is amazing - like the Quiver Tree Forest and Giant's Playground rolled into one, but better. Anyway, the biggest draw for me was to photograph the quiver trees after dark. I first got some moonlit shots, where the moon illuminates the foreground but stars are visible in the sky. This is always a balancing act - not enough moon and you can't see the foreground, too much moon and the sky is washed out. I had too much moon, so the shots are so-so (you can find them in my Namibia album). After the moon set, it was time to mount my nodal point adaptor onto the tripod and take some panoramas of quiver trees silhouetted against the Milky Way. The nodal point adaptor allows the camera to rotate about the nodal point of the lens, which eliminates parallax errors when changing the angle of view. This is important because, with very wide panoramas (which are needed if you want to include the whole Milky Way) you need to be very close to your foreground interest, otherwise it shrinks to insignificance. But if you're this close, you absolutely want to avoid parallax errors.If you're any good at DIY you can build your own adaptor, but if you're a klutz like me, you'll have to spend some money on this gadget. My wide-angle lens is a Tokina 11-16mm f/2.8, which is ideal for night skies: it has a wide aperture and is surprisingly sharp wide open (at least after I sent it in to have a decentering problem fixed) and the manual focus ring has a hard stop at infinity. I find the ideal exposure for a moonless night sky to be 30s, f/2.8, ISO 3200. At a focal length of 11mm the stars start showing slight streaking over 30 seconds, but I still find it acceptable, especially in a panorama (where the effective angle of view is much bigger). ISO 3200 is the highest sensitivity the 40D can manage, and the noise gets pretty bad. It's not so noticeable in the starry sky, but some fine texture is lost, which you can notice for example in grass or foliage. Again, this is acceptable in a panorama, where each frame only contributes to a small portion of the final image. I ended up shooting three panorama sets, including one of the entire sky. This one used 6 exposures and has a horizontal field of view of more than 180 degrees. I find it hard to visualise the final composition of a panorama, and I really wish I had made a few more to choose from. In the sky the Milky Way is a straight band, but in the panorama it usually gets rendered as an arch (I used an equirectangular projection), and one must try to visualise this arch in relation to the trees in order to produce a nice composition. The final framing is then done in the panorama stitching software (I use Hugin, which is free). It was difficult to find a good spot from which the quiver trees did not occlude each other. I didn't quite realise it at the time, but the light pollution from Keetmanshoop (some 20km away) really contributes to the image. It was lucky that, from my position, the glow seems to originate at one of the legs of the arch. I am not completely satisfied with this image, as I find it slightly unbalanced - the placement of the biggest tree doesn't feel right to me. The colours, on the other hand, are great. I find the most "realistic" white balance for night skies is "daylight", but that would make the light pollution too warm, giving the whole sky an unpleasant yellow cast. Instead, I used a colour temperature of about 3600K, which looks pleasing, and shows up the contrast between the warm city lights and the cool sky. I then boosted contrast in the sky (and reduced the foreground to pure black) with a curves adjustment in photoshop. I entered this image in a wide range of competitions (I believe in a shot-gun approach: send your image to as many (free) competitions as possible and hope for the best). It had some minor success at Pixoto (that site is based on an interesting concept of "image duels", go try it out) and at I-Shot-It (though another panorama made that night was more successful - that's for an upcoming blog post). I was really chuffed, however, when it was a runner up in the Burrard-Lucas Landscape Competition, and will also appear soon in Getaway and Country Life magazines. In my next post (which I've already started, but might take some time completing) I'll show another panorama I made that night, which I actually like more than this one. I'll also show what sort of curves adjustments I made. See you then! I tried to send you an email but didn't find any on your blog. Anyway, I have that same Tokina lens you mention and I'm having a problem with the focus. Could you please describe exactly what your problem was and how did you managed to fix it? Maybe the same problem is happening to mine and your experience could help get it fixed. Autofocus has always worked fine for me. I see. Mine is not as sharp as people keep saying this lens is and sometimes I can't focus to infinity. I noticed the second problem happens when I'm shooting under really cold weather (-3° for example). Does your focusing ring goes past infinity? Mine stops right in the middle of the infinity mark. I'm asking this because of my infinity focus problem. Hello Florian I'm not a photographer but I find this series of photographs enchanting. I intend to order them from you soon. But excuse my naiveté as I'm from New Jersey in the US and so there is so much light pollution. Can you see the Stars, milky way and Magellanic clouds with the naked eye as vividly or even half as vividly as the photographs or is done with filters of some kind? Thanks for your time and the photos. Hi there! Yes and and no... if you go somewhere with really dark skies you will see the stars and Milky Way clearly and vividly; and if you're in the Southern Hemisphere, you'll also see the Magellanic Clouds clearly. On the other hand, cameras see the world quite differently to our naked eyes: our eyes can discern much higher contrast, but in such low light will only see in black and white, which is why the colors seen by cameras at night always seem so surprising. Also, with the camera set to a 30 second exposure on ISO 3200, it can see much fainter objects than the eye will see, and I also boosted the contrast in post-processing. Lastly, the field of view in this photograph is more than 180 degrees, compressed into a single frame, which is why the Milky Way is distorted into an arc - normally it looks quite straight as it arches overhead. So all in all, being there and seeing this with the unaided eye is a very different experience from viewing this photograph, but arguably it is even better - nothing can replace actually being there and experiencing the cold and the calm of a desert night. Thanks for taking the time to answer and congratulations on winning a Sony World Photography Award. This was how I came to know your work. Awesome!! Lovely captures and experiences. Fantastic work. May I know what product of Nodal Ninja you use? Any recommendations? Thanks. It's a Nodal Ninja 3 with and EZ-leveler (very useful). With my camera set-up (Canon 40D + Tokina 11-16, no battery grip) this is just big enough, but with anything bigger (or a physically longer lens) a Nodal Ninja 4 would probably be better. Thanks for the info, Florian. I must confess I am amazed and pleasantly surprised of your gallery. I want to make you an offer. Please contact me if you are interested in what I might have to say. Amazing! lovely Photography. every thing lovely around the world.Thanks for shearing it here with us. Sir you did an amazing job here. The photo is candid but stylish and I love the color theme. I really liked this tree here. Great job, I wish you lived around here so I could have seen more from you.